Each year, World Affairs Councils around the United States host Academic WorldQuest competitions for high school students. The World Affairs Council of Dallas/Fort Worth hosts nearly 100 North Texas area teams, which participate each February. Teams of four (4) study for a chance to compete on the national level in Washington D.C. against other regional winners. Each JWAC may enter up to three (3) teams at $25 each. The competition consists of 100 multiple-choice questions, including 10 sections of 10 questions. Participants prepare for the competition by studying an online study guide. The World Affairs Councils of America decides the 10 topics based on the most relevant global issues of that year. In the case of a tie, the competition can go into a tiebreaker round of 10 multiple-choice questions and then a sudden death round of five questions that require write-in answers. Two of the 10 topics are consistent each year: Current Events and Great Decisions. The current events questions are based on world events from August 2018- February 2019, and the Great Decisions questions are from the 2018 edition of the Great Decisions publication by the Foreign Policy Association. The entire 2018 publication is fair game for the Great Decisions section of the local competition. 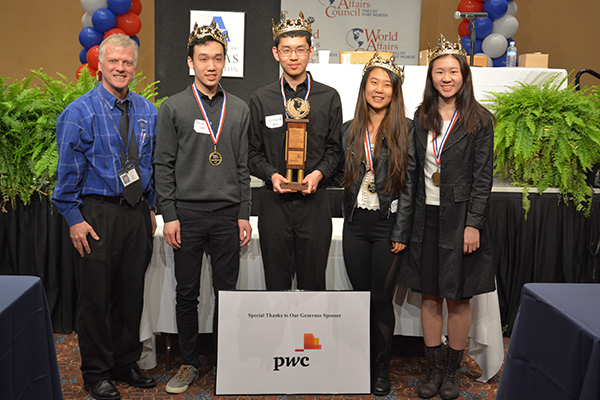 The 2019 PwC Academic WorldQuest Competition will be held on Tuesday, February 12, 2019, from 8 AM-1:30 PM at UT Arlington. Start studying early! Some teams start studying five months in advance of the competition. Divide and conquer the material amongst your teammates. Hold mock-competitions at your JWAC meetings. Keep up-to-date on current events from around the world. Include the latest edition of the Great Decisions publication in your study materials. Review the Academic WorldQuest guidelines and study materials. Read the articles listed in the study materials. In order to help JWAC sponsors prepare their students for the February 2019 Academic WorldQuest competition, the World Affairs Council will be hosting a two - two hour trainings on Saturday, November 3 from 10 AM -12 PM in Dallas and Saturday, December 15 from 10 AM - 12 PM in Bedford. During the workshop, educators will learn about how the competition is be facilitated, study strategies, preparation materials, and more! The training is complimentary to any sponsor affiliated with an active JWAC. Two hours of PD credit will be provided to educators who attend. Registration will be posted to the GYL calendar soon.